The New Zealand Census of Population and Dwellings (Māori: Te Tatauranga o ngā Tāngata Huri Noa i Aotearoa me ō rātou Whare Noho) is a national population and housing census conducted by government department Statistics New Zealand every five years. There have been thirty-three censuses since 1851. In addition to providing detailed information about national demographics, the results of the census play an important part in the calculation of resource allocation to local service providers. The 2018 census took place on Tuesday, 6 March 2018. The next census is expected in March 2023. Since 1926, the census has always been held on a Tuesday. Since 1966, the census officially occurs at midnight on a Tuesday in March. These are statistically the month and weekday on which New Zealanders are least likely to be travelling. Until 2018, census forms were hand-delivered by census workers during the lead-in to the census, with one form per person and a special form with questions about the dwelling. In addition, teams of census workers attempt to cover all hospitals, camp grounds, workplaces and transport systems where people might be found at midnight. In 2018, the process was different. The majority of households received an access code in the post and were encouraged to complete their census online. If preferred, households could request paper census forms. The smallest geographic unit used in the census for population data is the mesh block, which there are 39,300 of, with an average of 110 people in each. The first full census in New Zealand was conducted in 1851, and the census was triennial until 1881, at which time it became five-yearly. The 1931 census was cancelled due to the effects of the Great Depression, as was the 1941 census due to World War II. The 1946 census was brought forward to Tuesday 25 September 1945, so that the results could be used for an electoral redistribution (the first for ten years) before the 1946 election. 1951 was the first year in which Māori and European New Zealanders were treated equally, with European New Zealanders having had a different census form in previous years and separate censuses in the nineteenth century. Results for those censuses before 1966 have been destroyed with a few exceptions and those since will not be available before 2066. The 2006 census was held on Tuesday, 7 March. For the first time, respondents had the option of completing their census form via the Internet rather than by a printed form. The 2011 census was scheduled for Tuesday, 8 March. However, due to the Christchurch earthquake on 22 February 2011, it was cancelled. For the first time ever, all 2011 census forms would have been digitally archived. On 27 May 2011 Statistics New Zealand announced that a census would take place in March 2013. The legislation required to change the census date was introduced to Parliament in August 2011. The 2013 census was held on Tuesday 5 March 2013 and the 2018 census was held on Tuesday 6 March 2018. A few people object to the census and attempt to evade it. The most famous of these is the Wizard of New Zealand, Ian Brackenbury Channell, who has avoided the census on numerous occasions. He spent the night of the 1981 census in a boat beyond New Zealand's 20 km territorial limit in order to avoid enumeration in the country. He has also publicly burnt census forms. 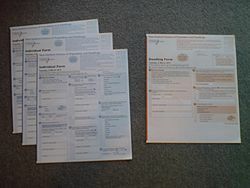 Following the 2006 census, Statistics New Zealand prosecuted 72 people for failing to return their forms, with 41 convictions. After the 2013 census, they wrote to 450 people in July 2013 who had failed to return the forms, of whom 99 were prosecuted, resulting in 46 convictions. Most of those convicted faced two charges and were fined $50 to $500 per charge. Results of the 2013 census were released over an 18-month period, beginning 15 October 2013. It recorded 4,242,048 people who were resident in New Zealand on 5 March 2013. This represents an increase of 214,101 people (5.3 percent) since the 2006 census. ^ "The Census Transformation programme". Stats NZ. Retrieved 5 February 2019. ^ a b "Dates of New Zealand censuses since 1851". Stats.govt.nz. Retrieved 16 January 2016. ^ "How Can I Do It?". Stats NZ. Retrieved 4 March 2018. ^ Galbraith, Christian. "Project: Census Evaluation - 2001 Census Evaluation". Social Science Research Centre - University of Canterbury - New Zealand. Retrieved 21 February 2013. ^ McRobie 1989, p. 95. ^ "New Zealand Genealogy". Genealogylinks.net. Retrieved Mar 8, 2015. ^ "Christchurch quake - census cancelled". 3 News. Retrieved 25 February 2011. ^ "What happens to your census forms?". Statistics New Zealand. Retrieved 16 February 2011. ^ "Census preparation underway". Statistics New Zealand. Retrieved 27 May 2011. ^ "Duties of Statutory Officers (Census and Other Remedial Provisions) Bill (2011)". New Zealand Parliamentary Counsel Office. Retrieved 10 August 2011. ^ "2018 Census". Statistics New Zealand. Retrieved 31 August 2017. ^ Fraser, R.; Hammond, M. (2008). Books Without Borders, Volume 1: The Cross-National Dimension in Print Culture. Springer. p. 32–33. ISBN 9780230289116. Retrieved 31 August 2017. ^ "Refusal to complete census results in 46 convictions". Statistics New Zealand. Retrieved 16 October 2014. ^ "2013 Census products and services release schedule". Statistics New Zealand. Retrieved 16 September 2013. ^ "2013 Census Usually Resident Population Counts". Statistics New Zealand. 15 October 2013. Retrieved 31 August 2017. This page was last edited on 8 March 2019, at 07:19 (UTC).